For those who have been convicted of a crime and exhausted all forms of appeal and post-conviction claims, a set-aside is likely the only option left. Arizona does not offer the possibility of an “expungement” of criminal convictions, as is available in many other states. When a conviction is expunged, it is effectively wiped off the record as if the crime was never committed. A set-aside, on the other hand, allows the crime to remain on one’s record but will be marked with a notation that the judge has set aside the judgment of guilt. Unlike expungement, the full benefits of a criminal set-aside require someone previously convicted to remain crime free. If one commits a new offense, the state may still use the set-aside conviction against them. There are still several potential benefits to pursuing a set-aside. A person whose conviction has been set aside is no longer a “convict” and no longer stands convicted of a criminal offense. While an employer may still ask if a person has “ever been” convicted of a crime, Arizona leaders are considering changes in the law that would prevent employers from finding out in the initial application process whether set-aside convictions exist in the applicant’s record. Apart from potential employment benefits, a set-aside can often come with other benefits, such as restoring one’s right to vote and possess a firearm or improving an immigrant’s possibilities in immigration court. Set-asides are available to most convicted persons who have completed their sentence, any probation term and paid all fines, fees, and restitution. 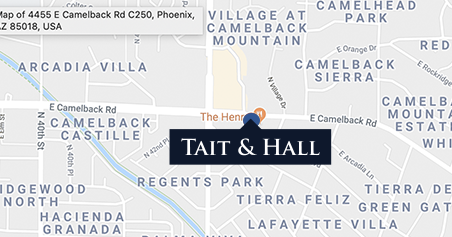 To find out about how to have your conviction set aside call Tait & Hall for a free consultation at: at (480) 405-6767.